In materials engineering, yield strength and tensile strength are two properties that can be used to characterize a material. The main difference between yield strength and tensile strength is that yield strength is the minimum stress under which a material deforms permanently, whereas tensile strength describes the maximum stress that a material can handle before breaking. When a solid material is not experiencing any external forces, all the molecules that make up the material are vibrating about their equilibrium positions. This is the lowest-energy configuration for the molecules, and if they are moved away from their equilibrium positions the molecules would attempt to get back to their equilibrium positions. Technically, stress is a measurement of these intermolecular forces. If the material is not under acceleration, then the intermolecular forces should be balanced by the external forces acting on the material. Therefore, we can get an indication of stress by measuring the external forces acting on the object. The stress ( ) on an object is given by the external force on the object divided by the cross-sectional area of the sample of a material. When the stress on a material is slowly increased, you can see that the strain increases in proportion in the beginning. If the force causing stress on the material is removed, then the material would return to its original shape. When a material is able to do this, we say that the material is elastic (think of a rubber band). If the stress on the material keeps increasing, then the material would eventually reach a point when the material becomes so deformed that, even when the deforming forces are removed, the material is unable to return to its original shape. The stress at which a material stops behaving elastically is called the yield strength. When the material is unable to return to its original shape, we say that the material is plastic. Suppose you keep increasing the forces on the material beyond yield strength. The material keeps deforming, and eventually the forces between the molecules become unable to counter the external forces and the material breaks. The maximum stress that the material can handle before breaking is called tensile strength or ultimate strength. When you look at the stress-strain curve above, the stress seems to decrease as the material keeps elongating. This is because the definitions of stress and strain used for drawing these diagrams do not take into account the changes in the area that occur when the forces are applied onto the material. Instead, here it is assumed that the area remains constant. This type of definition for stress that does not take changes in the area into account is called engineering stress. 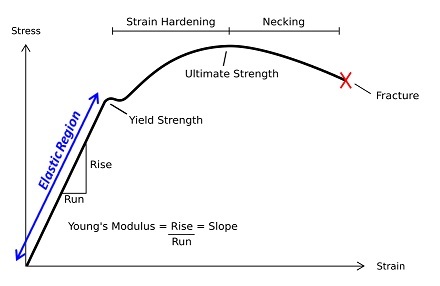 If the change in area is accounted for, then the stress-strain curve shows that as the material keeps elongating, the stress increases as well. The definition of stress that takes the continuous change in the area into account is called true stress. Yield strength is the stress that causes a material to lose its elastic behaviour. Tensile strength is the maximum stress that a material can handle before breaking.